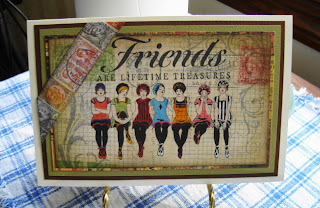 Vada's Blog Stamp Inks and Paper : GC #117 Chestnut Theme Challenge is “Gal Pals”. 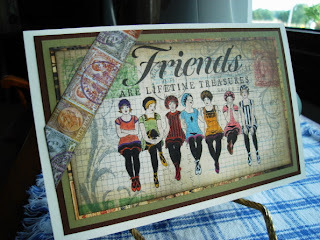 My Stamps are from 100 Proof Press (Ladies) and Hero Arts. Stamped on Designer paper from K & Company. I used Markers and color pencils. Thanks for popping in. This is definitely all about gal pals. Wonderful. Oh my gosh, I love, love, love it! Absolutely brilliant use of colors - it's gorgeous! Oh this is way too much fun! Love their little outfits and what a cool image! 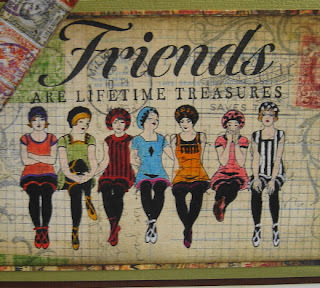 Great for "gal pals" and friends in general! You are fabulously talented! Hugs! Fabulous fun Ms. V! Love the rich colors & clean design! Wow, Vada, this is wonderful! Love the image and all your fantastic coloring. Vada, I REALLY like this one--the image is great, and the bright colors make it pop! Congratulations on your piece being the new Gingersnap Creations homepage art!